The Citadel Ruin is located in the Cedar Mesa area west of Blanding, Utah. The impressive fortification sits at the end of a peninsula that juts out into Road Canyon. The only access to the ruin is via a landbridge that runs the length of the peninsula. Getting down from the mesa to the land bridge requires scrambling down a section of slickrock where there is considerable exposure to the canyon below. The exposure is more than some hikers feel comfortable with and they end up turning around at that point. The trailhead is about 52 miles from the town of Blanding, Utah. To get there drive south on US Highway 191 for about 4 miles and turn west onto UT-95 toward Natural Bridges National Monument. Follow UT-95 for 28.4 miles and turn left onto UT-261. 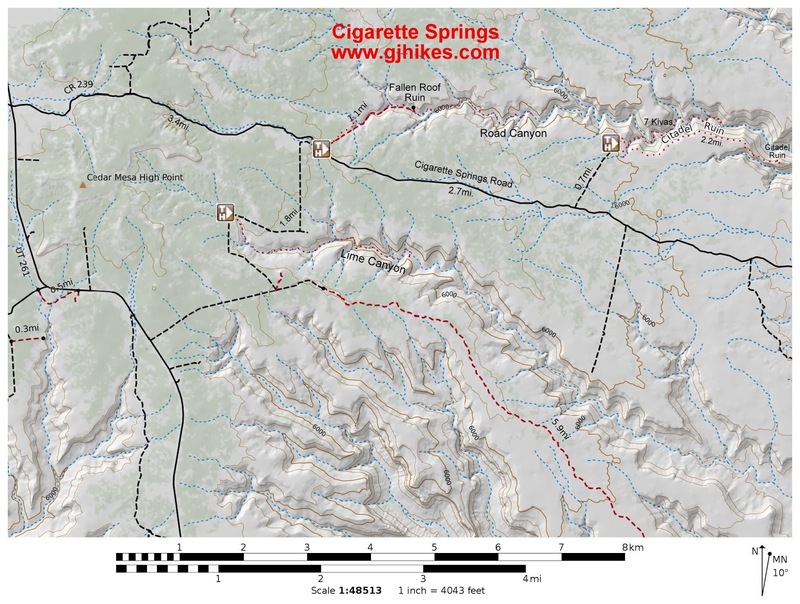 Continue south for 13.6 miles and turn left onto Cigarette Springs Road. After turning onto UT-261 you will pass the Kane Gulch Ranger Station where there is a small Visitor Center and restrooms that are accessible 24 hours. After turning onto the Cigarette Springs Road there is a gate at the 0.9 mile point where there is a self service fee station. At the 3.4 mile point the road passes the unmarked trailhead for the upper end of Road Canyon. A road that goes to the right at this point leads toward Lime Canyon. Around the 4.6 mile point the road crosses a wash and gets a lot rougher from that point on. Careful drivers with moderate clearance vehicles might be able to continue further. If not there is room to pullover and begin hiking from that point. The extra distance will add about 2.8 miles to the round trip distance. From the wash to the trailhead continue following the Cigarette Springs Road for about another 3/4 of a mile and turn left for the final 3/4 of a mile to the trailhead which is at the end of the road. The trail is pretty well worn nowadays from the many hikers that travel its course along the south rim of Road Canyon to the Citadel. The variations in elevation are very subtle making the trek along the rim relatively easy. Just past the half mile point from the trailhead, at a spot where the trail is within 20 feet or so of the rim, you can peer down into Road Canyon and see the Seven Kiva site beneath an overhang on the opposite side of the canyon. The closest access to that site begins from the same trailhead as the Citadel Ruin although it is a bit more difficult of a hike as it requires climbing in and out of the canyon. As the trail gets close to where it begins dropping off of the mesa it crosses an expanse of slickrock where it becomes necessary to watch for cairns to follow the route. 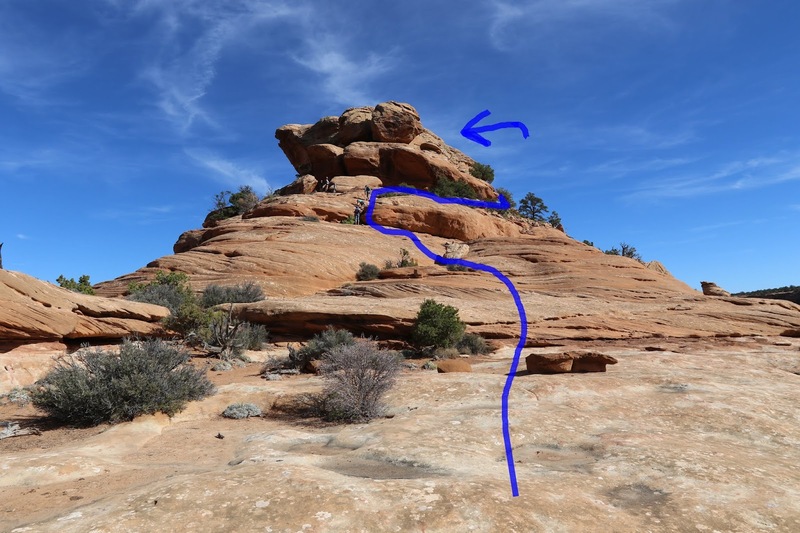 The cairns will lead to the edge of the mesa where the trail scrambles over the side and passes through a gap in the cliff. The trail makes another drop that takes it down to the next bench where it traverses around the south side of the ridge. If you continue around the point there is a nice overlook where you can see the land bridge that leads out onto the peninsula to where the Citadel Ruin is located. The ruin is on the right hand side of the cliff where it faces toward the south and isn't visible from this vantage point. Some hikers decide not to venture any further once they see where the route goes next. As you can see, it requires scooting down the slickrock to a sloped uneven bench that sits just above a precipitous drop into the canyon below. Those that trust their footing and sense of balance walk down this part while others opt to sit on their bums and scoot their way down. There should be enough photos in the slideshow at the end of this post to give a general idea of what you are getting into. The land bridge is very wide and comfortable to hike along. There are a couple of ledges to scramble up but nothing harder than what has already been accomplished up to this point. At the end of the land bridge you can hike all the way around on several different levels. To get right up to the Citadel you need to scramble up to the mid level and follow the bench around on the right. Once you make it around the bench below the ruin there is one more scramble to get up to its level. The only difficulty is a large step between the top of the boulder and the next shelf up. If you climb all the way up to the ruin be careful not to lean on the walls or enter any of the rooms. Most of the ruins are remarkably well preserved and well worth the effort to see up close. Walking completely around the bench will reveal more ruins that aren't nearly as well preserved. There is even a notch where you can climb all the way up on top. One thing to look for while hiking back toward the mesa along the landbridge are the remains of a wall that was probably used for defensive purposes to guard against unwanted visitors venturing onto the peninsula. There are several primitive campsites in the area around the trailhead as well as a few along the Cigarette Springs Road. The closest developed campgrounds are at Natural Bridges National Monument and Goosenecks State Park. There are quite a few places to explore in the Cedar Mesa area and the remote location makes camping a sensible option to be able to see more with each visit. As far as the Citadel Ruin goes, if you would like to see it for yourself then all you have to do is 'Take a hike'.